One more day that J and I get to spend together. She got home a little late from work and my tummy was already rumbling so I was pretty happy when she sat down on the couch and said, “I want Mexican.” Fine by me. Even though I had a pretty rough weekend picking restaurants, I decided to take a chance and try a place I’ve read good things about, but I knew was going to be either really great or really bad. Juanito’s Mexican Restaurant is on the corner of Burdick and Reed Avenue just south of downtown Kalamazoo. 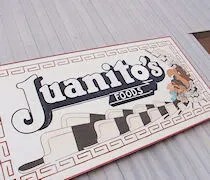 The restaurant used to be Las Juanito’s, but it has since changed ownership so the name changed to reflect the new owner. The owner, who is also the cook, came out and chatted for a while as we were finishing up our meal. He said he bought the place last year and opened it back up in December after the previous owners had to bow out of the restaurant business due to health issues in the family. The restaurant is pretty small with just a handful of tables in a narrow dining room. We were once again eating at an odd time and were the only ones in the restaurant so we had our pick of tables. We chose a booth with a wobbly table that was easily corrected with the bottle cap from my Coke. The menu is very simple and that’s what I liked about the place. Mexican restaurants are usually somewhat of a waste for me because I’m not a fan of the beans and rice that come with “combination plates.” I’d much rather have the a la carte option and just get the parts of Mexican cuisine that I truly like. As we were looking over the menu, J looked up at me and asked if I noticed chips and salsa anywhere on the menu. About the time she said it, I saw our waitress coming back with a tray with the chips and salsa she was looking for. 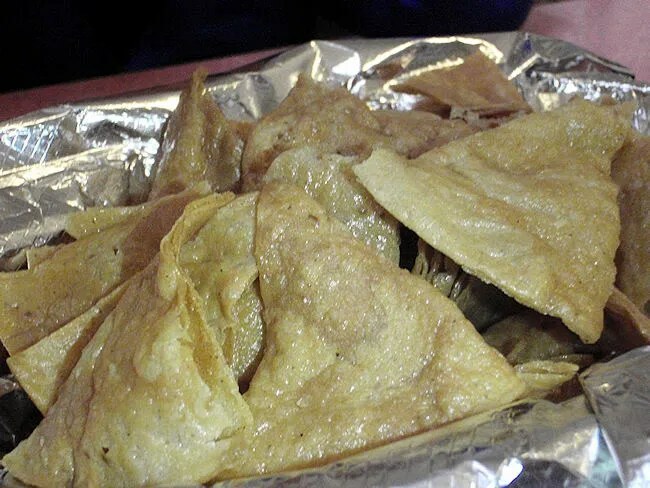 The chips were very obviously homemade corn tortilla chips. They were a little greasy yet deliciously crispy and salty. There were two cups of salsa delivered with the chips. One is the traditional red sauce which was just a bit spicy. The other was a green salsa that we both tried, but we both preferred the red one. For our meals, I ordered three tacos. I got one Carne Asada taco and two Carne/Ground Beef taco. 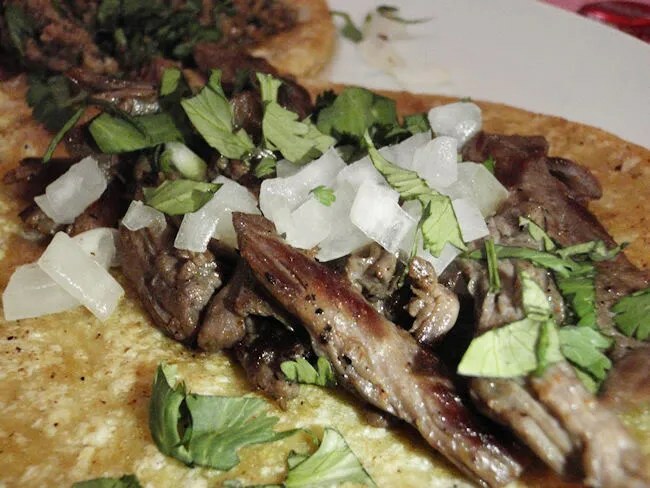 The tacos were served with two corn tortillas, cilantro and onion. 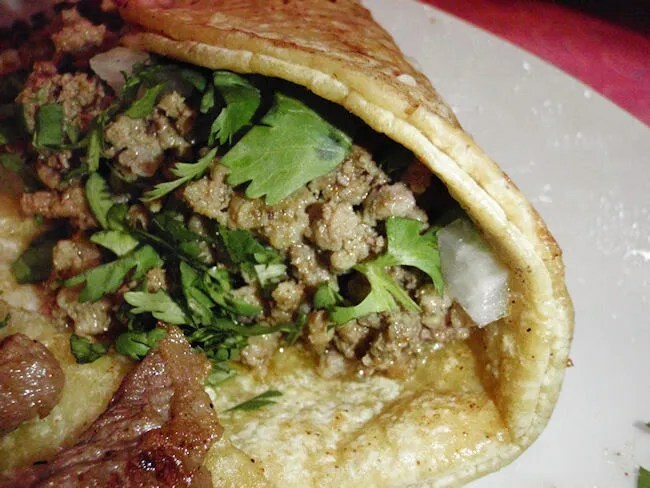 This is the more traditional way to serve tacos. I like more of a hybrid between the Americanized way and the traditional way….meaning, I like cheese instead of onions. I knew the onions were there, but I didn’t say anything when I ordered so I scraped them off when the plate came. I ate the Carne Asada one first. The steak was we seasoned and tender. The corn tortillas were amazing. Man, I love corn tortillas. There was a good amount of filling on all three tacos and the two ground beef tacos were actually almost over filled. I could have eaten five more of these tacos…not because they weren’t filling but just because they were so damn good I wanted more. 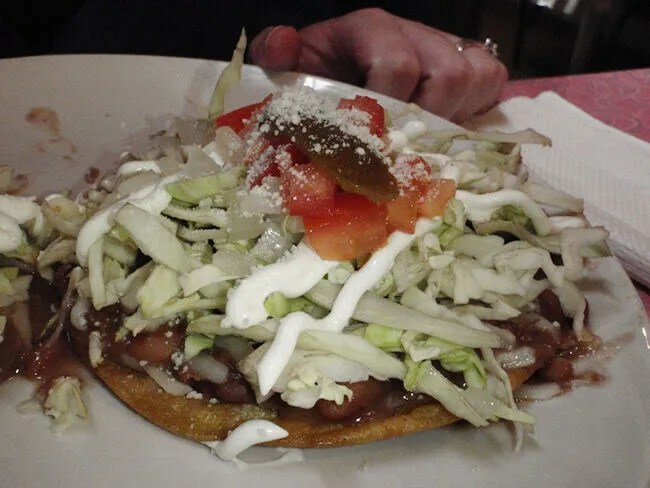 J ordered two bean tostado’s which came with cabbage, sour cream, tomatoes, and a hot pepper. She at first was going to order just one, but later decided on two. Even with all of the toppings, the toasta shells stayed pretty crispy. She had to use a fork to tackle the dish but seemed to really like it. I didn’t get the some vibe I got from her all weekend, so I’m guessing she was pretty happy and filled that Mexican craving she was having. The bill, $12.50…yeah, that’s it. Juanito’s is my kind of Mexican. The food was great and very cheap. The service was fantastic and I was surprised to see the owner come out of the kitchen to check on us when we were done. I’m a big fan of Mexican flavors, but as I’ve documented many times on this blog, I don’t like the traditional sides, so I feel bad when I go to Mexican joints. 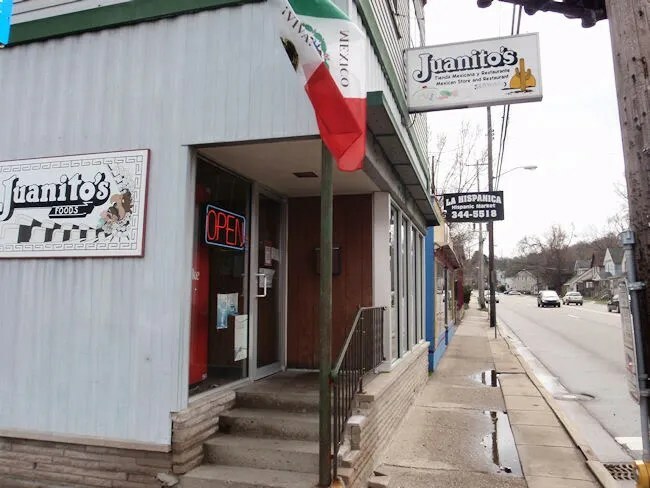 I don’t have to feel that way at Juanito’s because the menu is basic enough that I can get exactly what I want and just what I want.